Stasher Reusable Storage Bags are a plastic-free alternative to traditional storage bags and containers. 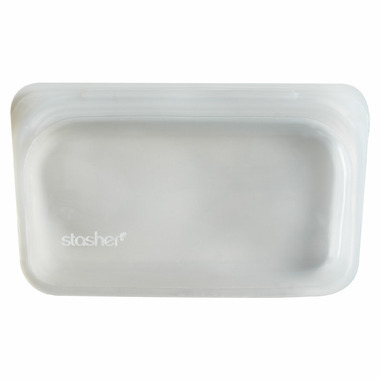 Made of 100% pure platinum silicone, Stasher delivers all of the ease and convenience of self-sealing plastic bags, but without the dangerous consequences. Very easy to retain food colour and both I bought got ripped after first uae. Very disappointed. I bought two of these bags. Silicone around seal of both bags were ripped after one minor use. A waste of money. Also, if you store liquid inside, make sure you don't press the bag after you seal it, otherwise water will come out. Customer sevice of Well.ca is fantastic as always! A fantastic little pouch! 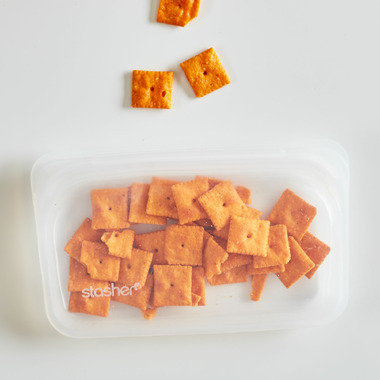 We needed another option for lunch bag snacks, don't get me wrong...we have used Ziploc for many years! We bought a couple of these. These pouches will hopefully last us years on their own. Seals very well. Convenient size, Flexible, Easy to clean! Can even be used for our sous vide machine ( hot water bath method for cooking) Just make sure it's fully dry/wiped dry before storing it away-sealed up. Mold can develop if certain steps aren't followed. We wish these were available on well.ca in several different sizes!